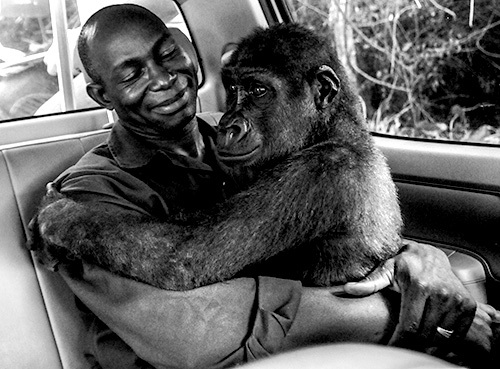 A heart-warming image of a gentle moment between a gorilla and a rescuer who saved her from being slaughtered is the winner of the Wildlife Photographer of the Year People’s Choice Award beating nearly 50,000 images to win the much respected prize. 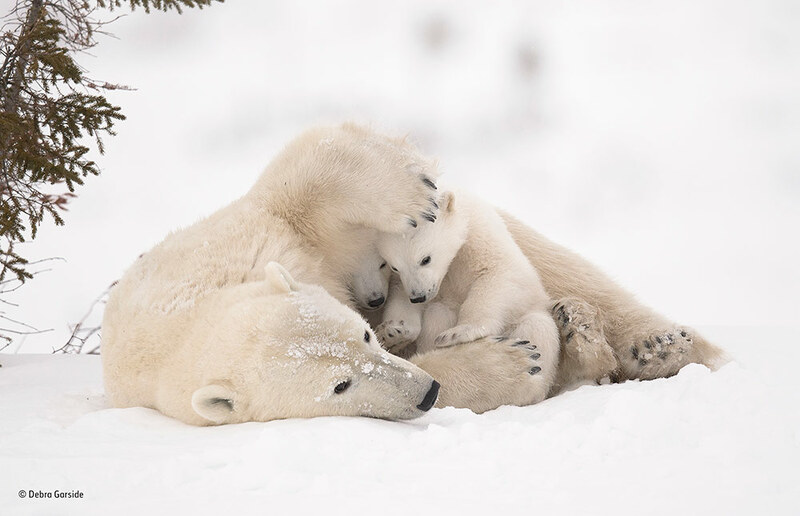 Canadian photographer Jo-Anne McArthur’s shot, called ‘Pikin and Appolinaire’ emerged as the favourite. Jo-Anne’s image was chosen from a shortlist of 24, selected by the Natural History Museum from almost 50,000 entries submitted for the 2017 competition. Below are the winners and finalists. Pikin, a lowland gorilla, had been captured and was going to be sold for bushmeat but was rescued by Ape Action Africa. Jo-Anne took this photograph as the gorilla was being moved from her former enclosure within a safe forest sanctuary in Cameroon to a new and larger one, along with a group of gorilla companions. She was first sedated, but during the transfer to the new enclosure she awoke. 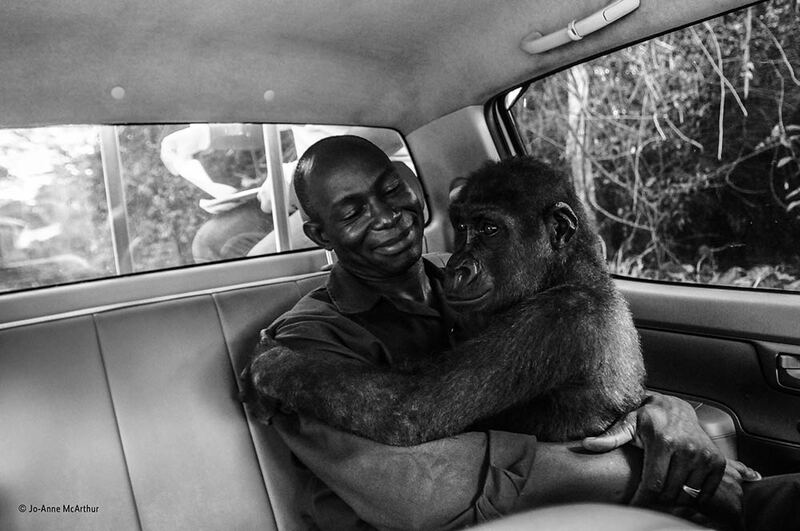 Luckily, she was not only very drowsy, but she was also in the arms of her caretaker, Appolinaire Ndohoudou, and so she remained calm for the duration of the bumpy drive. 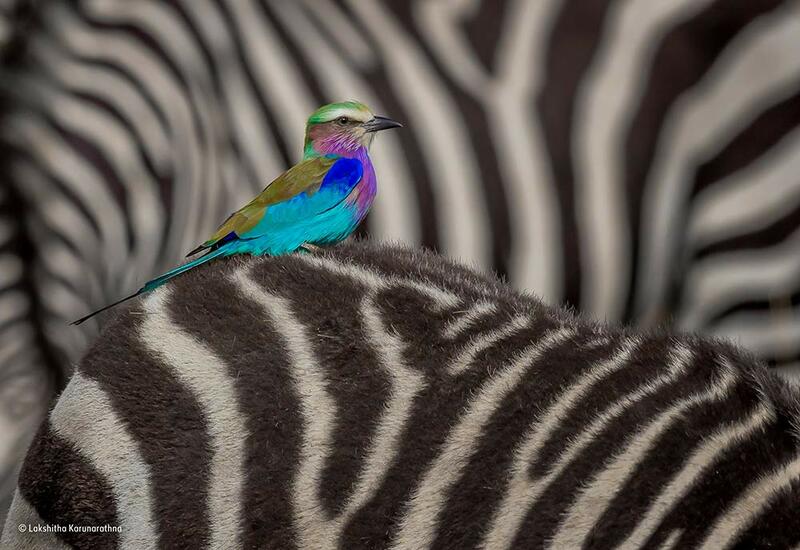 Lakshitha was on safari in Maasai Mara National Reserve, Kenya, when he spotted an unusual sight -- a lilac-breasted roller riding a zebra. Normally they prefer to perch high up in the foliage, but this roller spent an hour or more riding around and enjoying the occasional insect meal. Lakshitha waited for the surrounding zebras to form the perfect background before taking this tight crop. 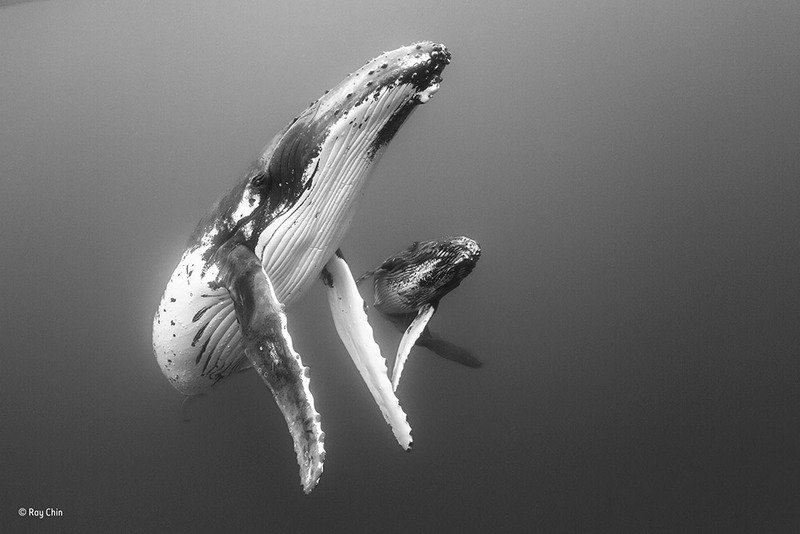 Every year from July to late October southern humpback whales migrate north from their Antarctic feeding grounds to give birth in the warm sheltered waters off Tonga. Ray encountered this humpback mother and calf peacefully floating in the plankton-filled water around the island group of Vava‘u, Tonga. After Ray gently approached them, the giants swam a bit closer to have a look at him.  While they made this elegant turn, Ray took the shot.  He later converted the image into black and white which he felt represented the simplicity of the scene. 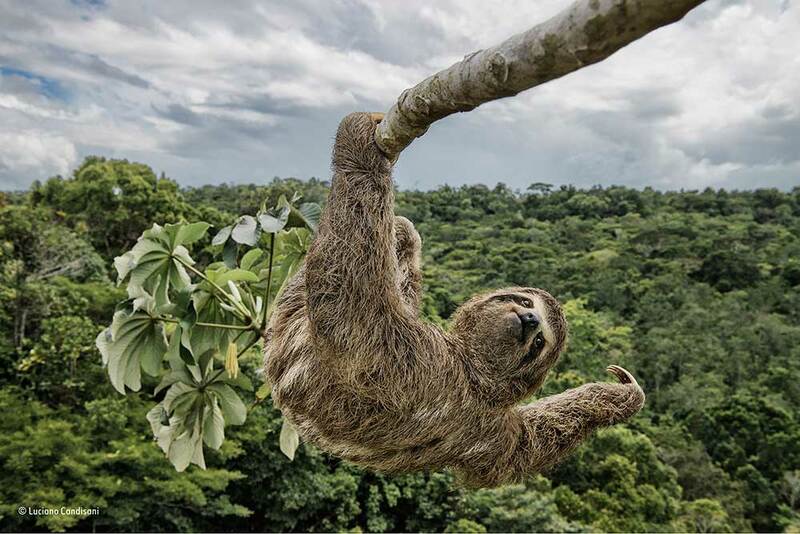 Luciano had to climb the cecropia tree, in the protected Atlantic rainforest of southern Bahia, Brazil, to take an eye-level shot of this three-toed sloth. Sloths like to feed on the leaves of these trees, and so they are often seen high up in the canopy. When polar bear mothers and cubs emerge from their dens in the early spring, the cubs stay close to their mothers for warmth and protection. Once the cubs are strong and confident enough, they make the trek to the sea ice with their mother so that she can resume hunting for seals. Debra waited six days near the den of this family, in Wapusk National Park, Manitoba, Canada, before they finally emerged. In the most challenging conditions she has ever faced, temperatures ranged from -35˚C to -55˚C with high winds, making it almost impossible to avoid frostbite and keep her camera gear functioning properly. Jaw-dropping images from the wild!